Download "Explanation. Overseas Hire Expatriate Teacher. 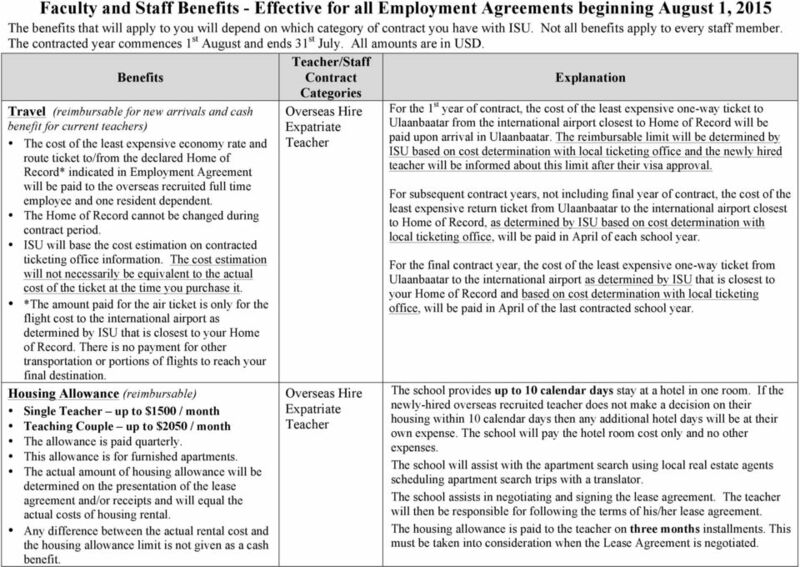 Overseas Hire Expatriate Teacher"
1 Faculty and Staff Benefits - Effective for all Employment Agreements beginning August 1, 2015 The benefits that will apply to you will depend on which category of contract you have with ISU. Not all benefits apply to every staff member. The contracted year commences 1 st August and ends 31 st July. amounts are in USD. /Staff Benefits Contract Categories Travel (reimbursable for new arrivals and cash benefit for current teachers) The cost of the least expensive economy rate and route ticket to/from the declared Home of Record* indicated in Employment Agreement will be paid to the overseas recruited full time employee and one resident dependent. The Home of Record cannot be changed during contract period. ISU will base the cost estimation on contracted ticketing office information. The cost estimation will not necessarily be equivalent to the actual cost of the ticket at the time you purchase it. *The amount paid for the air ticket is only for the flight cost to the international airport as determined by ISU that is closest to your Home of Record. There is no payment for other transportation or portions of flights to reach your final destination. Housing owance (reimbursable) Single up to $1500 / month Teaching Couple up to $2050 / month The allowance is paid quarterly. This allowance is for furnished apartments. The actual amount of housing allowance will be determined on the presentation of the lease agreement and/or receipts and will equal the actual costs of housing rental. Any difference between the actual rental cost and the housing allowance limit is not given as a cash benefit. Explanation For the 1 st year of contract, the cost of the least expensive one-way ticket to Ulaanbaatar from the international airport closest to Home of Record will be paid upon arrival in Ulaanbaatar. The reimbursable limit will be determined by ISU based on cost determination with local ticketing office and the newly hired teacher will be informed about this limit after their visa approval. For subsequent contract years, not including final year of contract, the cost of the least expensive return ticket from Ulaanbaatar to the international airport closest to Home of Record, as determined by ISU based on cost determination with local ticketing office, will be paid in April of each school year. For the final contract year, the cost of the least expensive one-way ticket from Ulaanbaatar to the international airport as determined by ISU that is closest to your Home of Record and based on cost determination with local ticketing office, will be paid in April of the last contracted school year. The school provides up to 10 calendar days stay at a hotel in one room. If the newly-hired overseas recruited teacher does not make a decision on their housing within 10 calendar days then any additional hotel days will be at their own expense. The school will pay the hotel room cost only and no other expenses. The school will assist with the apartment search using local real estate agents scheduling apartment search trips with a translator. The school assists in negotiating and signing the lease agreement. The teacher will then be responsible for following the terms of his/her lease agreement. The housing allowance is paid to the teacher on three months installments. This must be taken into consideration when the Lease Agreement is negotiated. 3 Teaching Couple with two or more resident children: up to $1400. 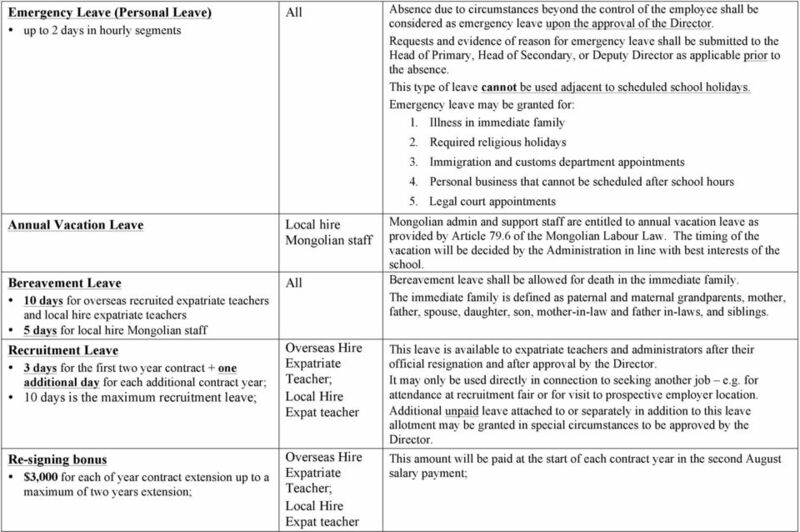 Mongolian Exit/Entry Visa (reimbursable) applicable to the overseas hire expatriate teacher and one resident dependent (if applicable); Mongolian Work Visa & Residency Permit (Alien Card) (reimbursable) applicable to the overseas hire expatriate teacher and local hire expatriate teacher; International Medical Insurance 1 applicable to the overseas hire expatriate teacher and one resident dependent (if applicable); worldwide medical insurance coverage subject to some restrictions; i.e. in USA and Canada only emergencies may be covered 1 ; NOTE: The school asks that US and Canadian citizens inform us in writing by January 15th (or date of hire for new teachers) of the prior school year IF they wish health coverage for elective (non-emergency) treatment in the USA or Canada. 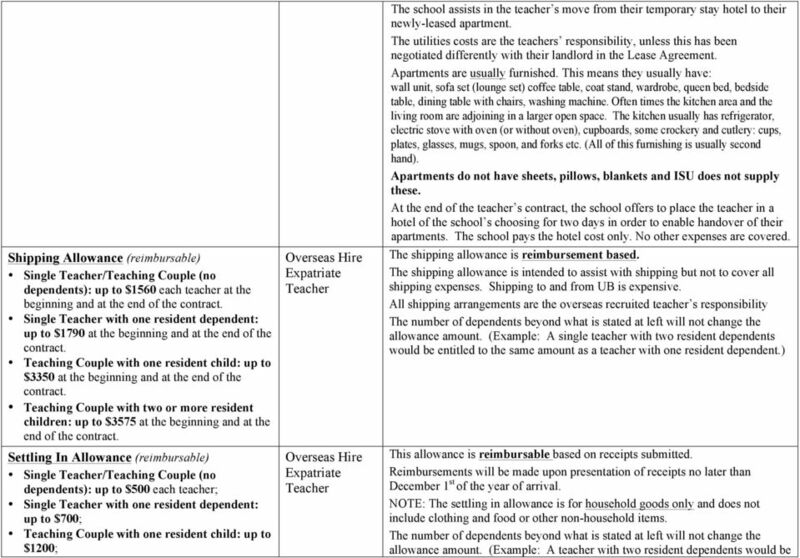 entitled to the same amount as a teacher with one resident dependent.) The overseas recruited teacher is responsible for obtaining their entry and exit visas for themselves and their resident dependents and the costs will be reimbursed for the overseas hire expatriate teacher plus one resident dependent. The school will assist with obtaining the visa but the teacher must adhere to the required protocol by the Mongolian immigration authorities. If an overseas recruited teacher has additional dependents that are not covered with their benefit, the school will help to obtain visas as well. 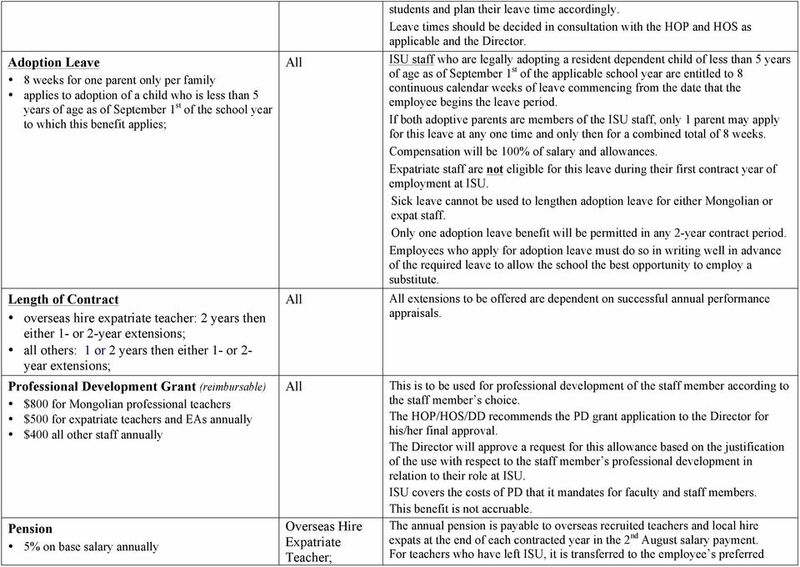 The visa expenses for these extra dependents will be deducted from the teacher s salary. NOTE: passport expiration dates including dependents must have a minimum of 12 months at the time the visa application is submitted. 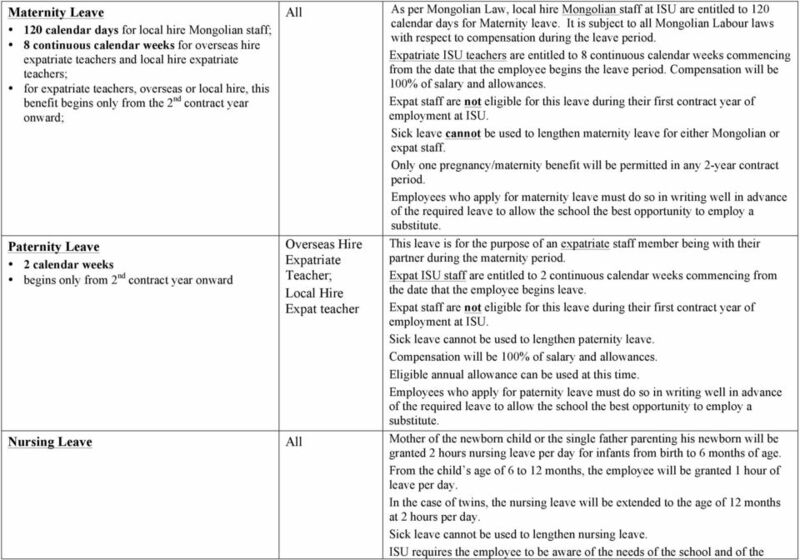 The Mongolian work visa and permit will be obtained by the school only for ISU expatriate employees. ISU covers the costs. An employee shall cover the cost of renewing their visa and permits if they: 1. renews his/her passport and the visa has been issued in the old passport and must be transferred into the new passport; 2. loses his/her passport and accordingly applies for visa re-issuance; 3. loses or damages his/her Alien Card (residential permit card). Currently ISU uses Scholar s Health Insurance that includes medical, dental & vision coverage with co-payment and annual deductible of $250. This is international health and accident insurance subject to some restrictions. (ISU may change the health insurance provider if it is deemed to be in the best interest of school.) 1 In USA and Canada, this international health and accident insurance will cover accidents and medical emergencies that arise during a travel in these countries. 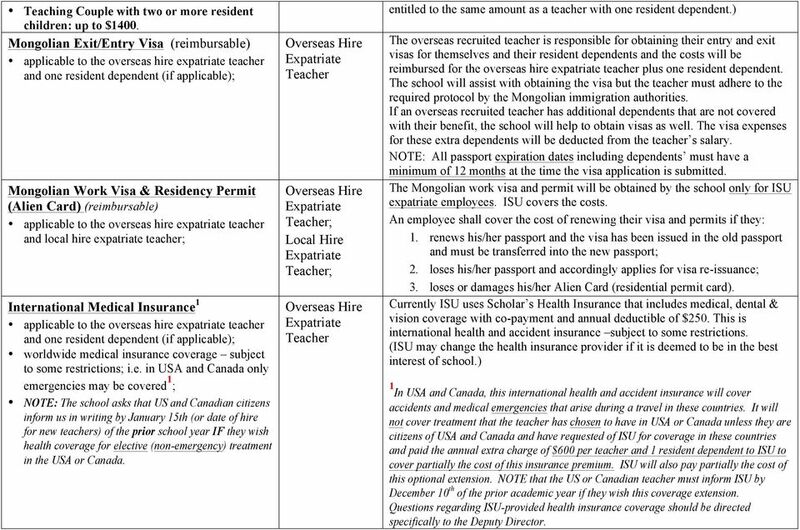 It will not cover treatment that the teacher has chosen to have in USA or Canada unless they are citizens of USA and Canada and have requested of ISU for coverage in these countries and paid the annual extra charge of $600 per teacher and 1 resident dependent to ISU to cover partially the cost of this insurance premium. ISU will also pay partially the cost of this optional extension. NOTE that the US or Canadian teacher must inform ISU by December 10 th of the prior academic year if they wish this coverage extension. Questions regarding ISU-provided health insurance coverage should be directed specifically to the Deputy Director. 4 SOS Medical Clinic Membership for local medical services; applies to overseas hire expatriate teacher and one resident dependent (if applicable); for locally employed expatriate teacher only - this membership does not extend to any resident dependents Tuition Waiver/Capital Bldg Fund Reduction does not include the annual registration fee; the annual capital building fund fee is reduced for 1 resident dependent Local dental subsidy (reimbursable) applies to local hire Mongolian staff and faculty and immediate family up to equivalent of US$300 total per year Local medical costs subsidy (reimbursable) applies to local hire Mongolian staff and faculty and immediate family up to equivalent of US$600 total per year Sick Leave up to 12 days accruable up to 30 days Expat Mongolian staff Mongolian staff This membership provides staff with access to the SOS local clinics with English-speaking doctors trained by the Western standards. It also provides benefits such as medical consultation, annual health check-up and emergency medevac to overseas treatment if deemed medically necessary. This SOS membership may be removed as of the start of school year ISU staff are also able to attend the new Grand Med and Intermed hospitals if they so choose and this would be covered by the Scholars Insurance. 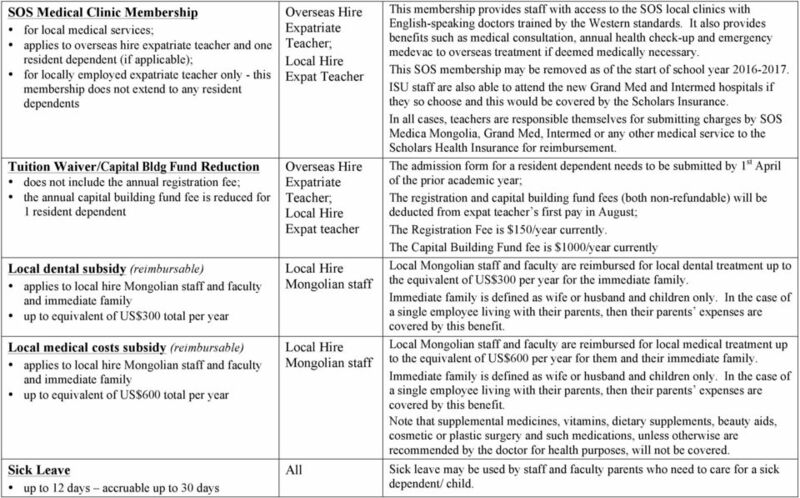 In all cases, teachers are responsible themselves for submitting charges by SOS Medica Mongolia, Grand Med, Intermed or any other medical service to the Scholars Health Insurance for reimbursement. The admission form for a resident dependent needs to be submitted by 1 st April of the prior academic year; The registration and capital building fund fees (both non-refundable) will be deducted from expat teacher s first pay in August; The Registration Fee is $150/year currently. The Capital Building Fund fee is $1000/year currently Local Mongolian staff and faculty are reimbursed for local dental treatment up to the equivalent of US$300 per year for the immediate family. Immediate family is defined as wife or husband and children only. In the case of a single employee living with their parents, then their parents expenses are covered by this benefit. Local Mongolian staff and faculty are reimbursed for local medical treatment up to the equivalent of US$600 per year for them and their immediate family. Immediate family is defined as wife or husband and children only. In the case of a single employee living with their parents, then their parents expenses are covered by this benefit. Note that supplemental medicines, vitamins, dietary supplements, beauty aids, cosmetic or plastic surgery and such medications, unless otherwise are recommended by the doctor for health purposes, will not be covered. Sick leave may be used by staff and faculty parents who need to care for a sick dependent/ child. Scope: Fringe Benefits and end of service indemnity specified in this section apply to all employees working on full time basis. Conditions of employment and additional benefits at UBS in Switzerland. Your advantages with UBS. It encompasses all expenses related to travel, external professional development activities and other related business expenses. Duke University Health System Benefits Overview: Non-Exempt 2015 We are pleased to provide you with information about your benefits at Duke. Our organization is rich in heritage and is proud of its work. Social assistance: 2% of covered payroll. Government. Social insurance: None; contributes as an employer. Social assistance: Any deficit. 1.3 Prior to the assignment the employee receives and signs an individual employment contract which forms part of the terms of employment. WHAT IS LABOR INSURANCE (WORKERS COMPENSATION INSURANCE)?